I'm in the last stages of writing a quilt pattern for a magazine. Although I've written a couple of patterns (bags and appliqué) before, this is my first time writing for a magazine. It's been exciting, stressful and a HUGE learning experience. And whilst I cannot claim to be an expert (one pattern an expert does NOT make! ), I thought I'd share with you a few things I've learnt. I can't share the quilt with you yet, but what is a post without pictures? 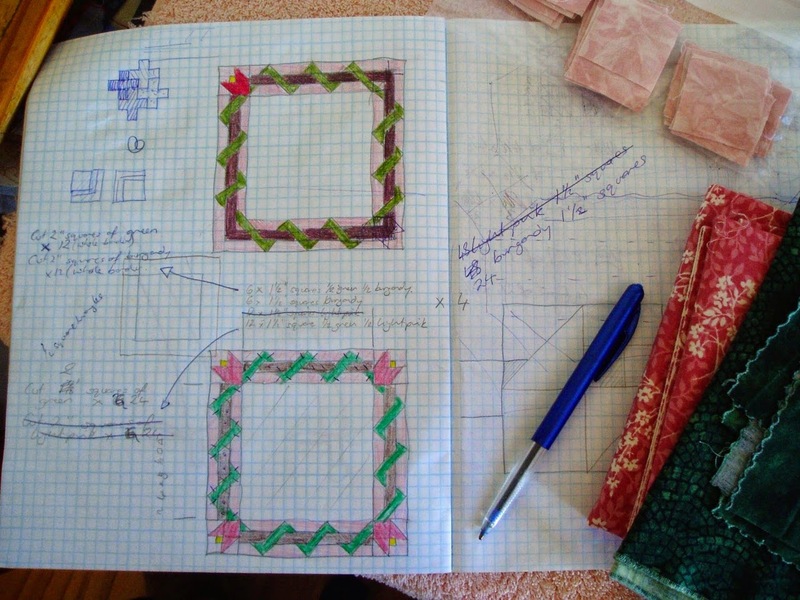 Either write your pattern before you start stitching or whilst you are making. It's really hard to go back and write a pattern from just looking at your work. You don't think you'll forget, but you do! Read lots of different patterns from lots of different sources to get an idea of what works and what doesn't. Remember, no copying, but you will get a feel for how you want to do it. Don't try and write the whole pattern in one go. Your eyes and brain go funny and you actually stop 'seeing' the numbers and sizes. Break it up and every time you come back to it you'll catch something that you didn't notice before. No, this isn't the quilt either, but graphed books are where all my quilts start. Proof read the pattern both on-screen and on-paper. There is something different about printed material and you will notice different things. Find someone who is willing to go over the pattern for you. Whether you go so far as to get actual testers (a good idea) or not, the least you should do is have someone proof read it. And then my last suggestion has to do with my dear loving family. 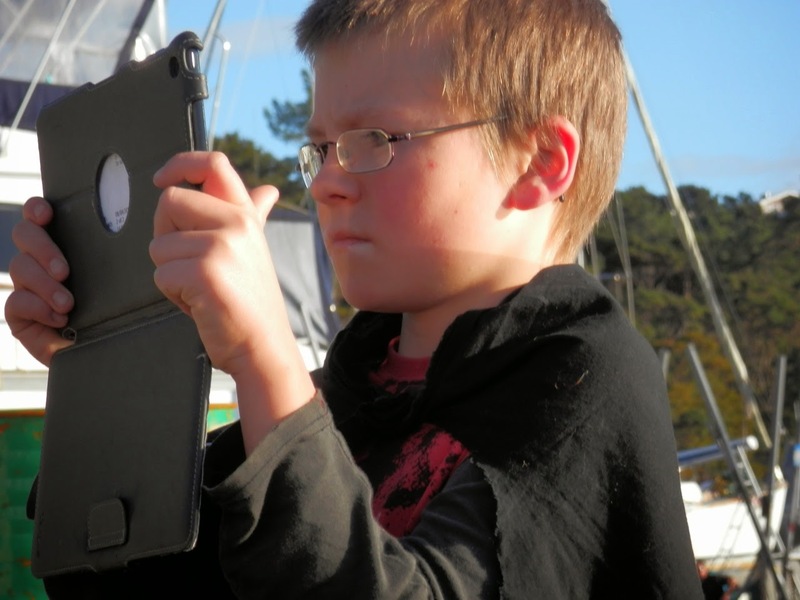 Do not even bother trying to write patterns during school holidays. Do not bother trying to write patterns when your husband is in the room. And DO NOT attempt to proof read when there are other humans within a 30 metre radius.....just saying. I'll let you all know when the pattern comes out, then you can check how good my pattern writing skills really are! 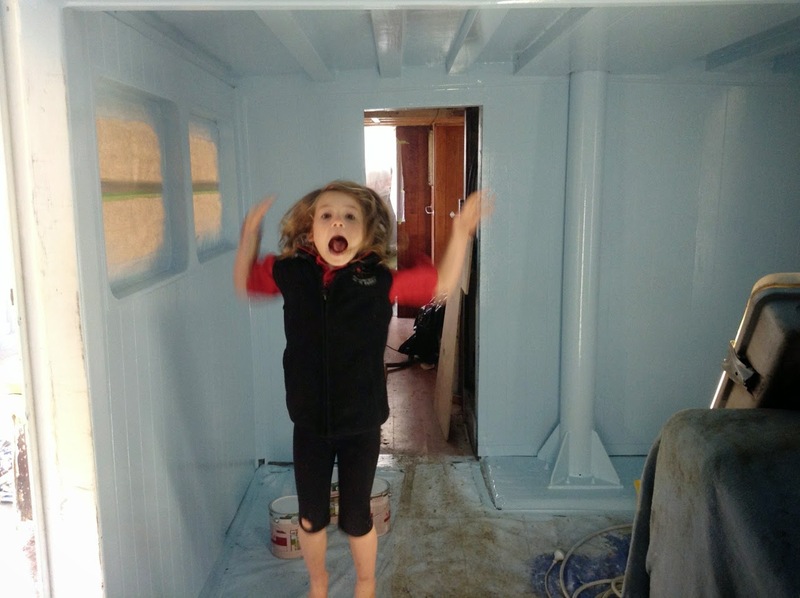 This is a photo-heavy post and is all about the boat. 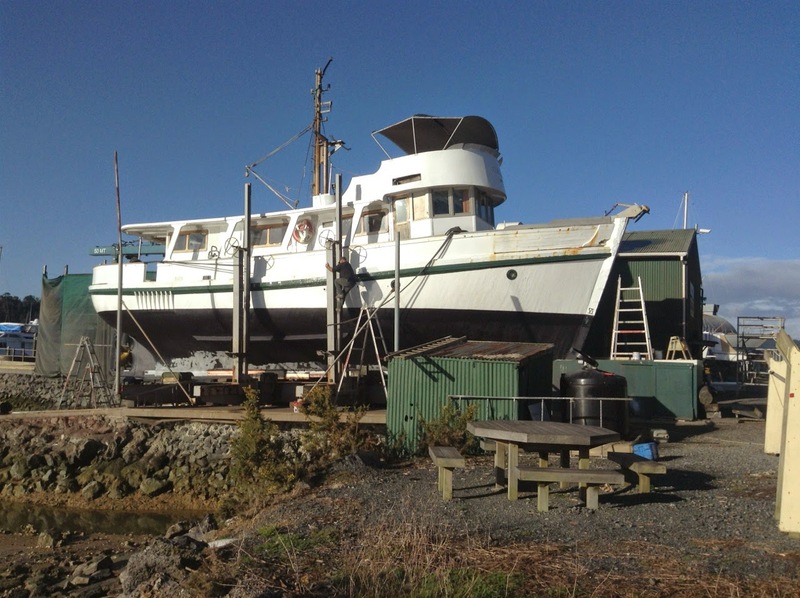 MV Cerego is being turned into a home for my family and I. 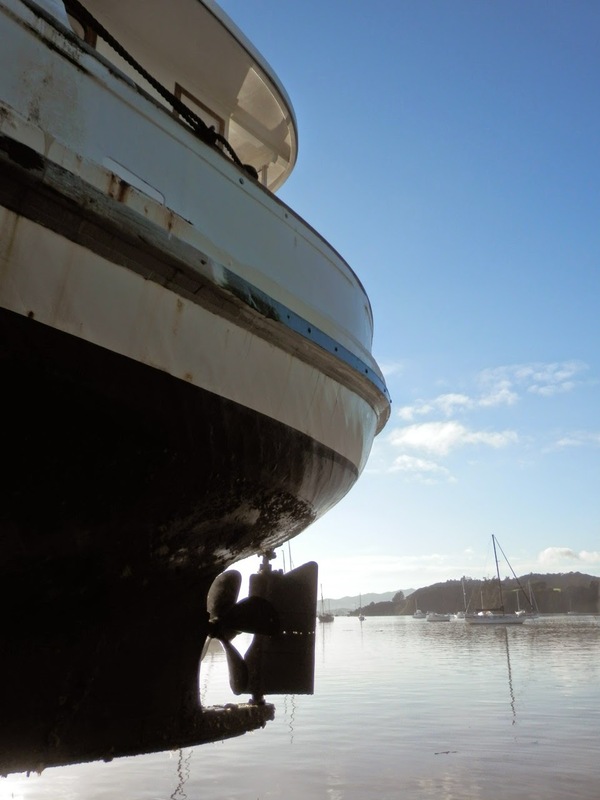 We hope to be living aboard soon. 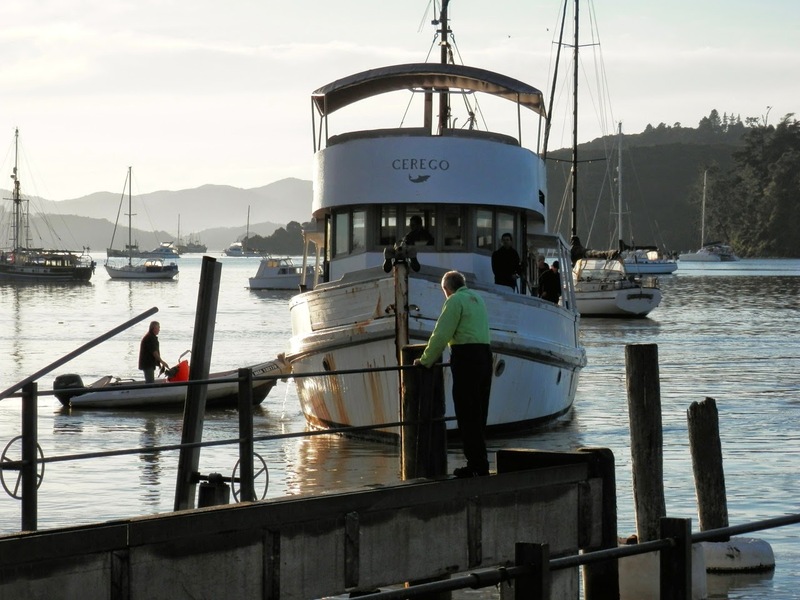 MV Cerego came out on the slip last week. It was also the first time my husband had moved her from the dock, so he was practicing piloting her at the same time. He had plenty of helpers and it was a clam, beautiful day. I was nervous but kept myself occupied by taking lots of pictures, and even a little video of them winching her out (I could try and post that if anyone is interested). She looks huge sitting up there out of the water. That is a big shed behind her! But, of course, photos can't really convey it. 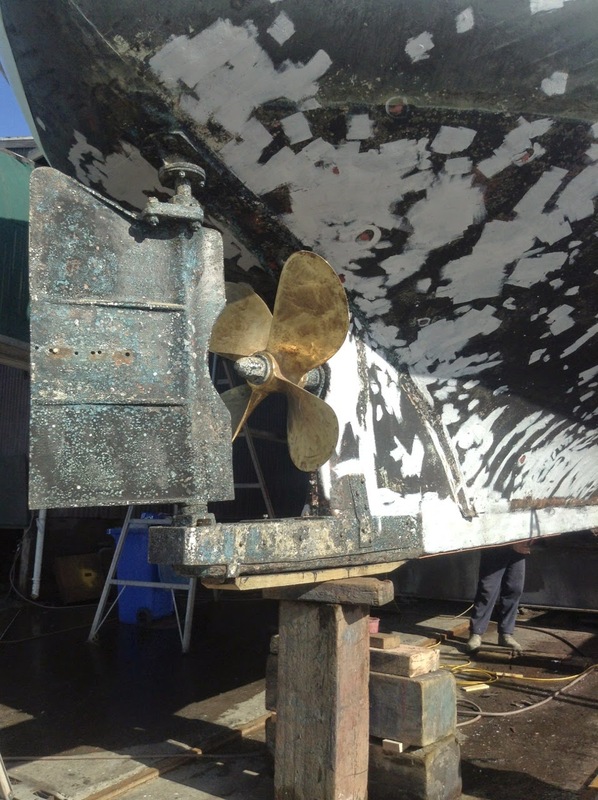 And a week or so later, she is cleaned, painting has begun, and her propeller is shiny. The work continued inside too. 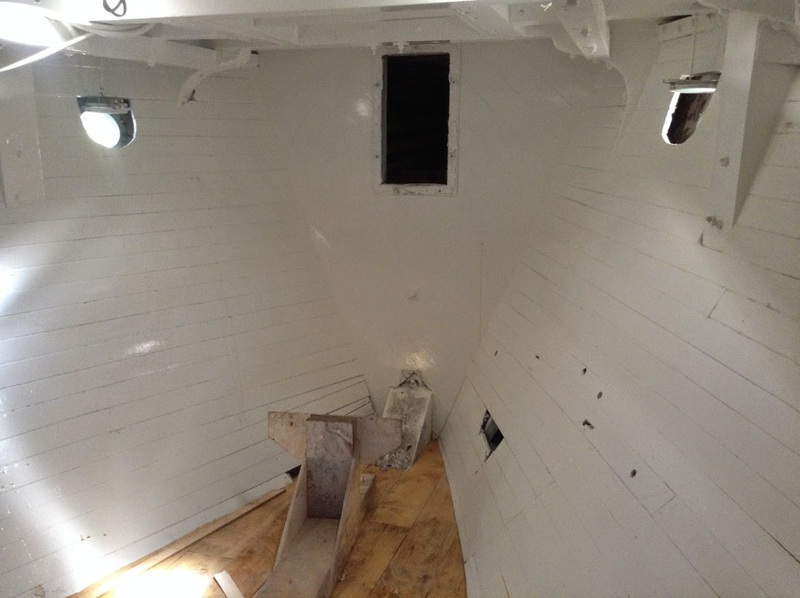 There are bunks appearing, staircases being put in, painting finished off and wiring being done. 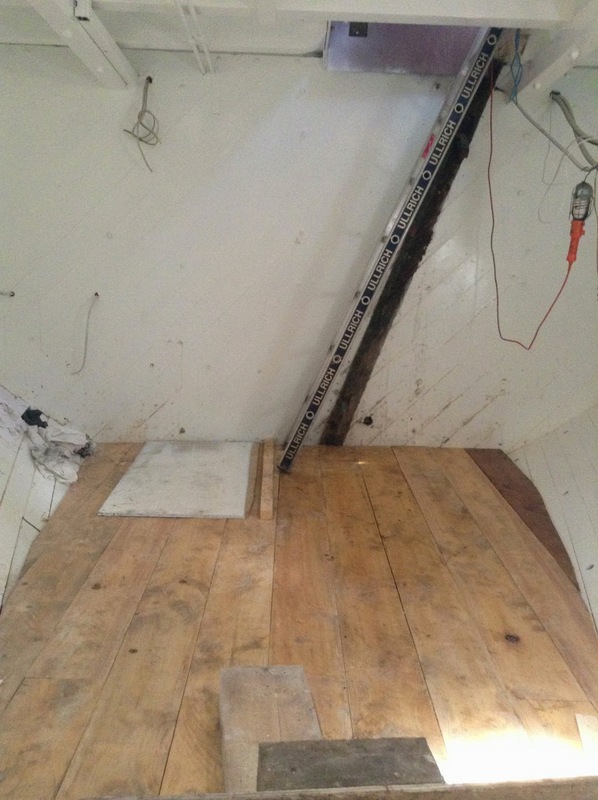 There is even have a floor in the forward cabin, my bedroom-to-be. Don't you think the pointy end of this room would be a great place for a built in desk with a Sweet Sixteen mid-arm sewing machine?! I suggested this to my Husband and he wasn't completely averse to the idea so I think I might keep working on him. 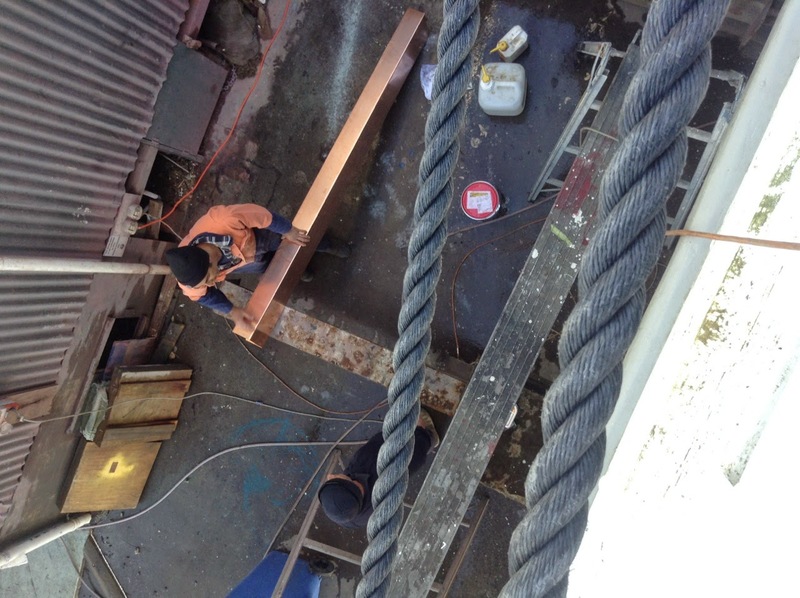 In this picture I'm standing on the deck looking over the side at a worker holding some of the shiny new copper sheathing that is being put on her keel. It's a vertigo-inducing long way down. 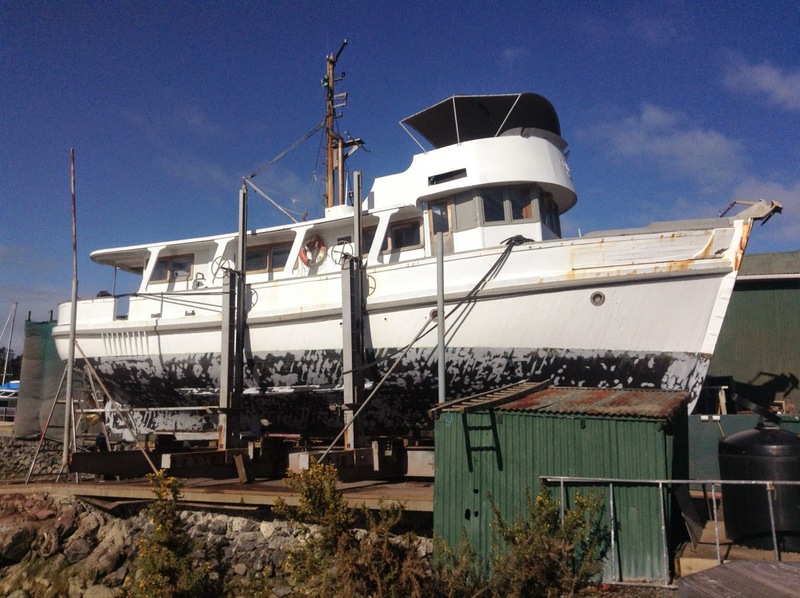 Then here she is almost, almost ready to go back in the water. You can see the shiny copper if you look close - this gets painted black. 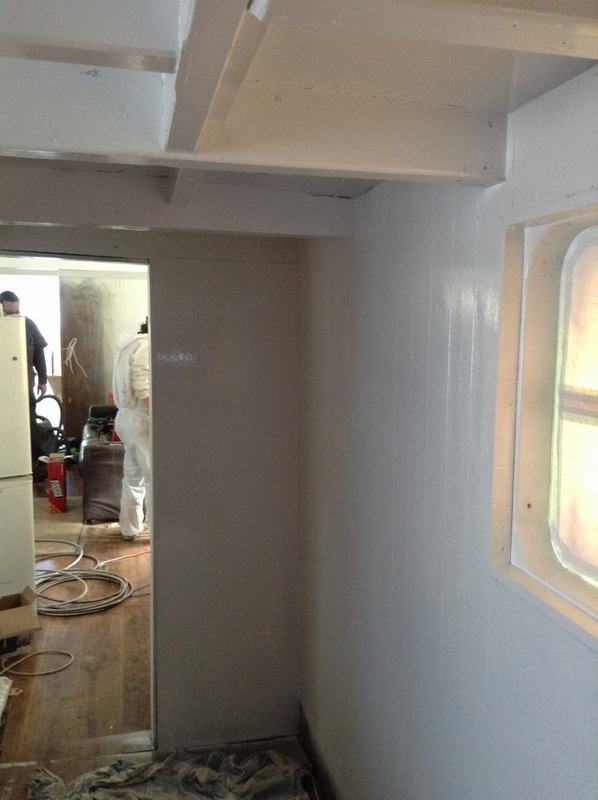 Her belting has been painted dark green, the rest of the trim will be done later. That last photo was taken at a time of intense stress. Every morning Cerego was being carefully jacked up in sections so they could work on her keel. That morning something didn't go quite right and she began to lean. Gulp. That's about 50+ tonne of boat. Everyone was cleared out and they carefully repositioned the cradle arms as much as they could. Then they lowered the cradle back into the water and waited for the tide to come in. 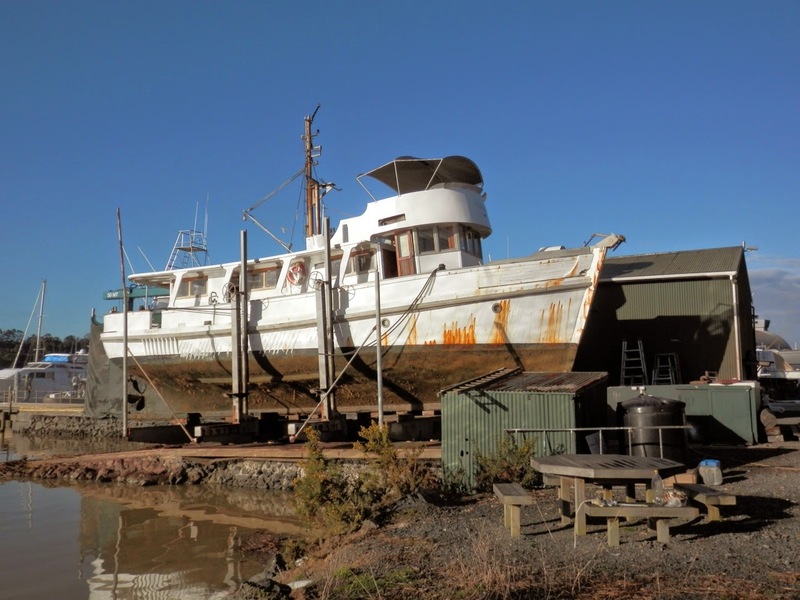 They refloated and levelled her and then pulled her back out. Sounds simple, but it was several hours of scary moments. 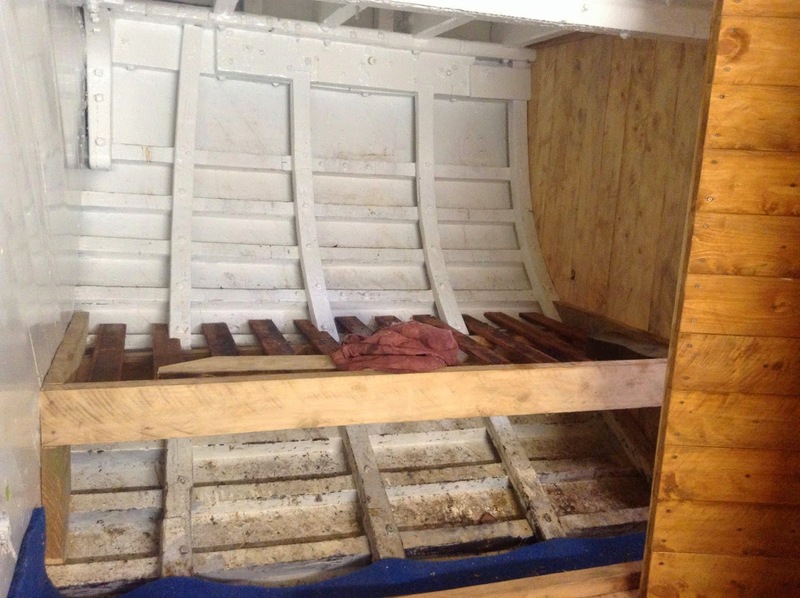 MV Cerego is now back in the water, all the work on her underside done. Hubby got her back to her dock with no dramas and now everyone is concentrating on her insides again. A little while ago, Lily sent me an email requesting an appliqué pattern of my Tui (a native New Zealand bird) that she had seen on my blog (or maybe Pinterest?) and also asking if I had a Kiwi pattern. I drew and wrote them up for her and sent them off. Remember me? you very kindly sent me the pattern for your Tui bird together with the Kiwi and another. I have finished my quilt for my friend and sent it over-seas. She has got delivery of the quilt last week and the first thing she did was cry - she loved it ! Phew it was such a challenge for me being new to applique but in the end I was glad it turned out ok. You will see that I have used Jenny Hunter designs out of NZ Quilter which I could get back copies from our library. I have been in touch with Jenny Hunter and will also be sending her a copy of this e-mail. Lily took my patterns and turned them into her own. 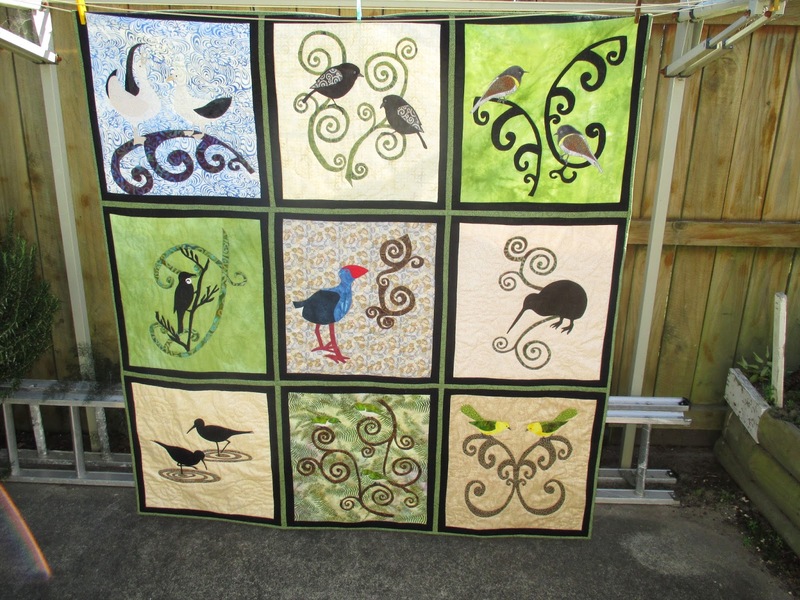 The Tui on the left middle and the kiwi on the right middle are my designs, but she added koru (spirals) to them to make them work with the rest of the panels. How fantastic! It was really fulfilling to see someone inspired by my designs, but use them to create something special and unique. 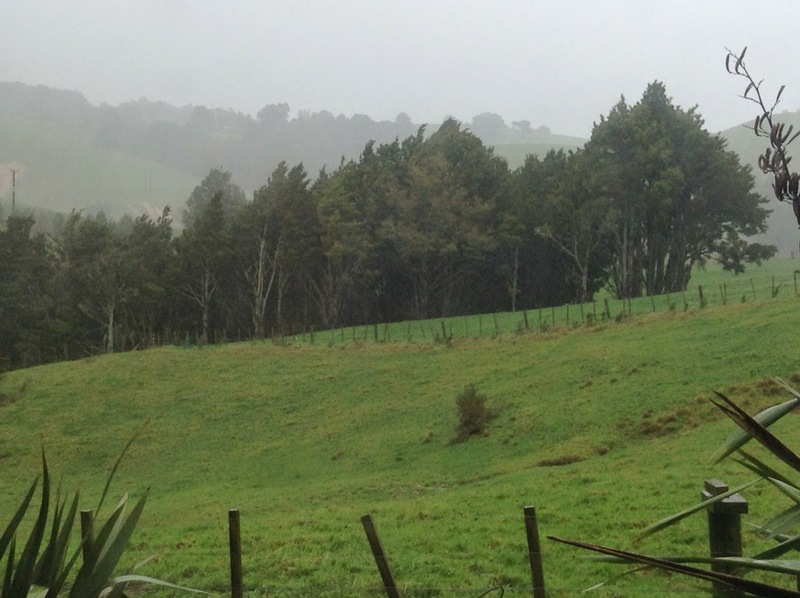 On this podcast I whine about the weather, I admit it! It's been revolting for a week now - floods and gales etc. I'm pretty sure you're allowed to whinge after your chicken food shed door got ripped off, right? This is taken out the back door in a relative break in the weather. 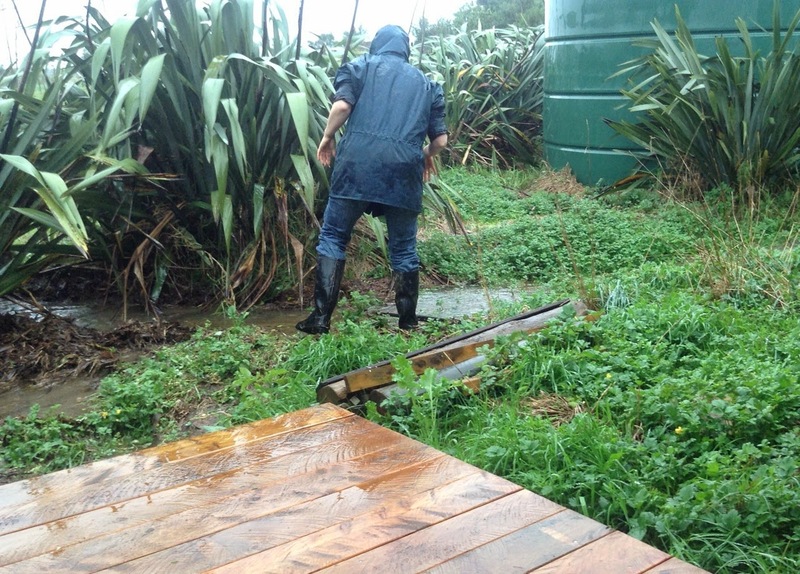 And my darling daughter took this one of me, clearing out the flooding drain. Again. 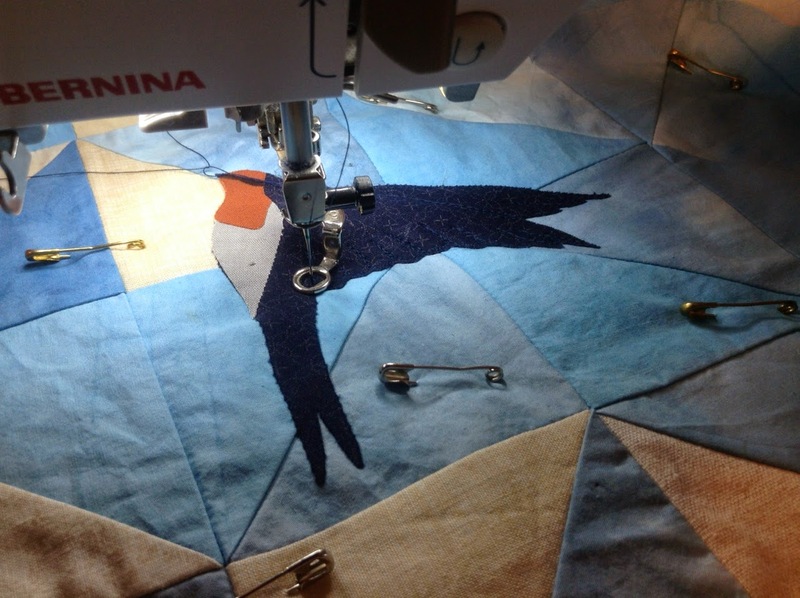 I give a rundown on my Welcome Swallow quilt. It's under the needle finally. In this pic I'm quilting and appliqueing at the same time....'cause I can. I also talk about mono printing - taking a single print off a surface, in this case a gelli plate - onto fabric. 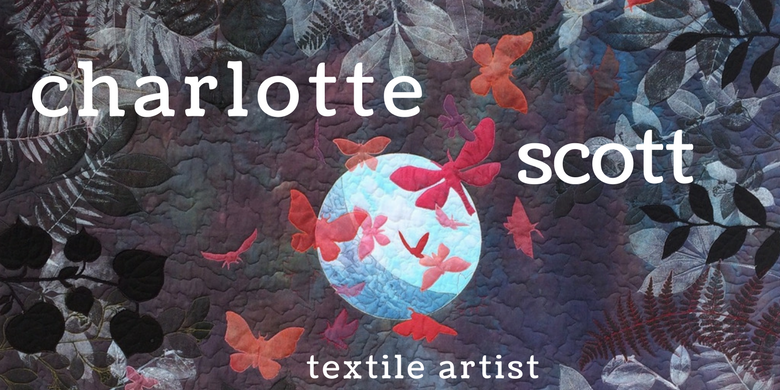 I'm going to be doing a demonstration of it at our quilting club's regional day. 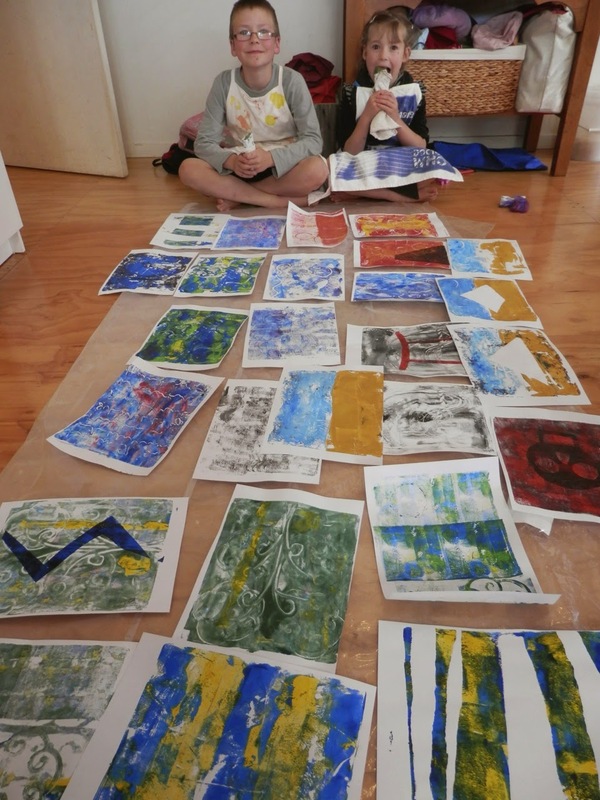 This is a picture of some mono printing on paper that I did with the kids. It's been a little while, maybe I should do some more with them this holidays. We really need some more rainy day activities! Issue 165 of Down Under Quilts, one of Australia's most popular quilting magazines, goes on sale today. 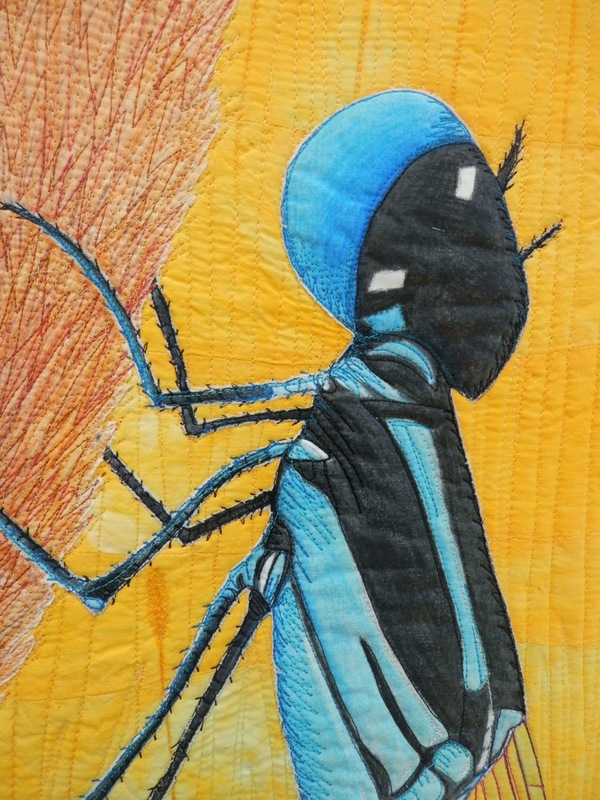 They have an article featuring Living Colour!, the travelling exhibition curated by Brenda Gael Smith and my quilt is one of the ones featured. I haven't shared a process post on this quilt yet. We were asked to keep the quilts to ourselves until after the first exhibition, so I only showed tiny snippets here and there. So I thought this might be the right time to share. Plus we've had the most revolting weather here over the last couple of days, and I could do with some bright, summery colours! Here is where I started. I drew out the size of the finished quilt on my big roll of brown paper (most useful quilting tool ever) and then, using pencil then pastel crayons, I drew out my dragonfly. 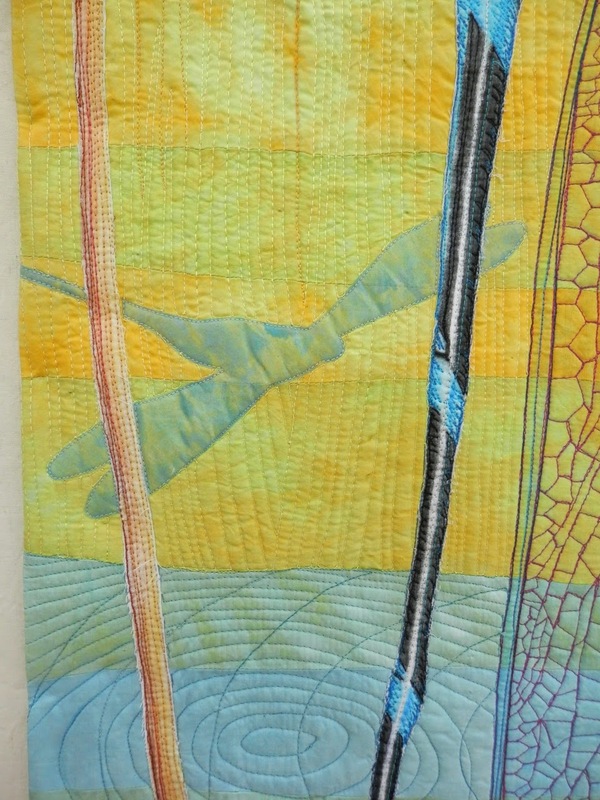 I decided that I wanted to use a complementary colour scheme for lots of energy in my quilt. My dragonfly was blue and the opposite of blue on the colour wheel is orange. 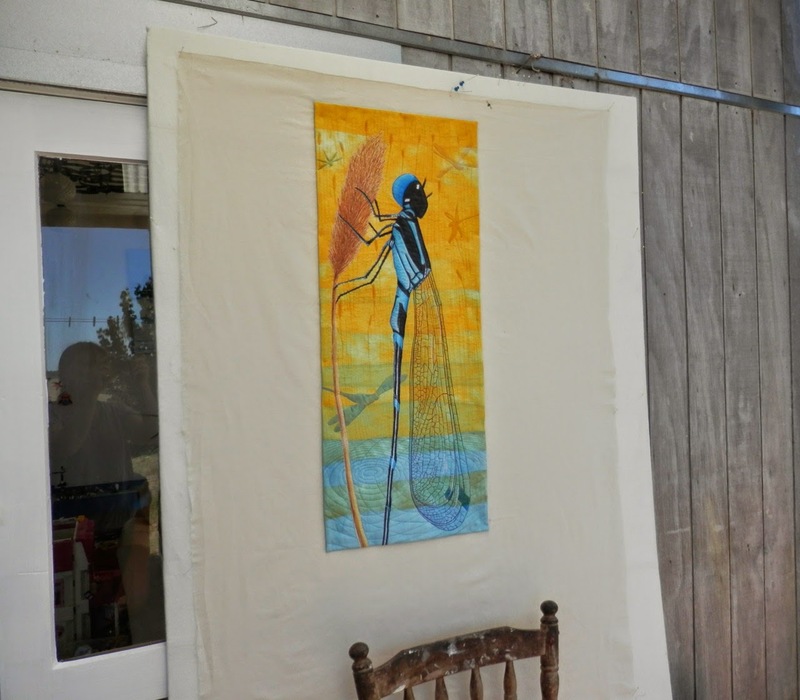 So on white fabric I masked out the shape of the dragonfly using freezer paper and proceeded to paint and print in shades, tints and tones of orange (and a little bit of blue). Unfortunately I hated the final result - boring, messy and nothing to do with dragonflies!! I started again. This time I drew out my dragonfly on white fabric and coloured it using coloured pencils. I was happy with the dragonfly, but then I started on the background. I got to the stage you see above and again....boring!! I opened my fabric cupboard to see if my muse was hiding in there and lo and behold, my eye lit upon a stack of co-ordinating silks that I had hand dyed. Mmmmmm, much better. I pieced these using gentle curves and did a little dance of happiness when I saw the result. I knew it was perfect, even if it wasn't a direct complementary colour scheme. Lesson: know the theory, then go with what feels right. I painted over the dragonfly and seed head with fabric medium to set the pencil and give it that slightly deeper, more painterly effect. Then I carefully cut it out and glue basted it to my background. Once I had my top together I pin basted it with the backing and batting. 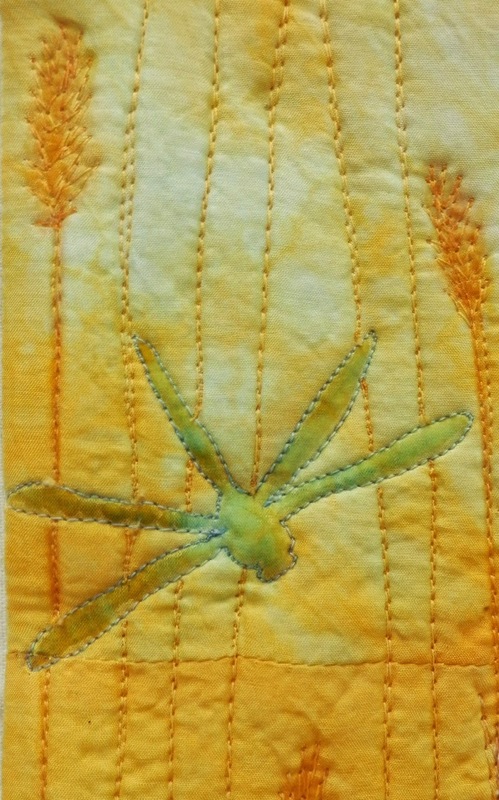 I did this before I appliquéd the dragonfly on so I didn't have to use stabiliser. For the wings I drew the patterns on water soluble film and quilted over this. I didn't use water to dissolve it because I didn't want to wet my quilt, but I've found the water soluble film tears away fairly easily. I also used it to create small silhouettes of dragonflies in the background. 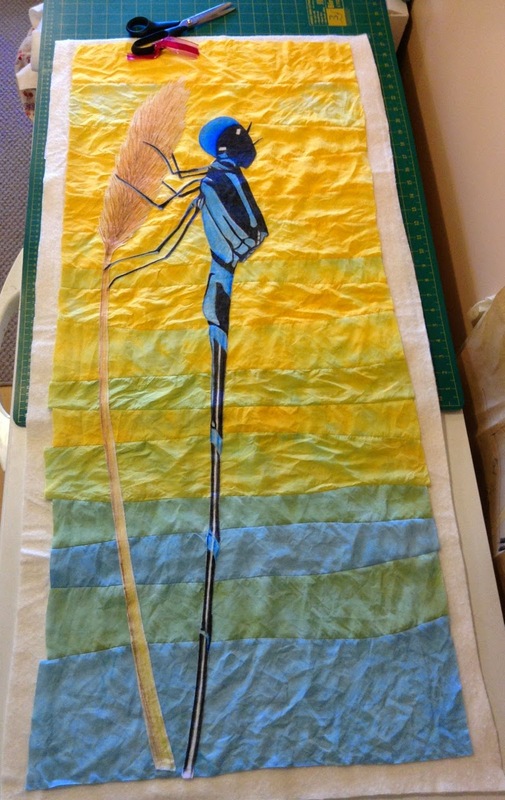 I added the blue dragonfly in the background using silk organza. I just felt it needed something for balance. I don't normally fuse organza, but I knew this was going to be a travelling quilt so I wanted it to be sturdy. I coloured in the wings and the background dragonflies using coloured pencil just to give them a little more substance. One of the hardest things was getting the ripples on the water right. The curves really caught your eye if they were wonky so there was a little bit of reverse sewing and a few choice words said during that part. In the end it wasn't perfect, but then, that's the joy of handmade. I did lots of long vertical lines to suggest grass and put some seed heads on some of these for texture in the background. I thread 'sketched' (I wouldn't call it painting) the grass seed head and the shading and highlights on the dragonfly's body (and all the tiny leg hairs - that was fun....). Once I was happy with it, I trimmed it to size and then finished it was a facing. That was nerve wracking as it had to be a certain size and I wasn't sure how much fabric the facing would take up. In the end I think I just squeaked in a smidge under the size requirement. This is how I photographed it. I took my design wall out onto my deck on a bright but cloudy day and put an ironed piece of calico onto it. Then I placed the quilt flat and square. I had to use a couple of silk pins in the corners, but I put them through the back so they didn't show on the front. I then set my camera up on top of the barbecue (I need to get a tripod) and took heaps of photos using all the different settings so I had a choice of which one was the most accurate portrayal. Thank you to Brother Australia for supporting the Living Colour! exhibition. And a huge thank you to Brenda, who has done the most amazing job of putting together a beautiful, cohesive collection of quilts, and a wonderful job of promotion and publicity. 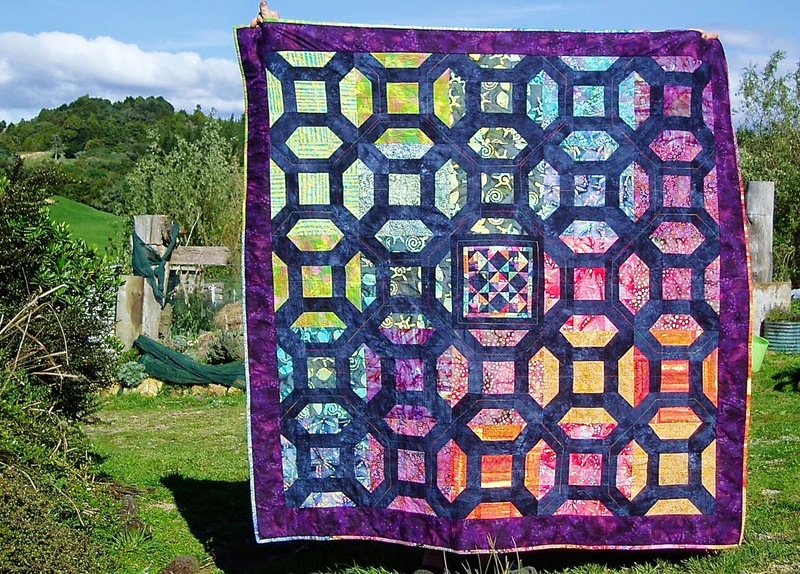 I can't wait to see the quilts when they reach New Zealand! 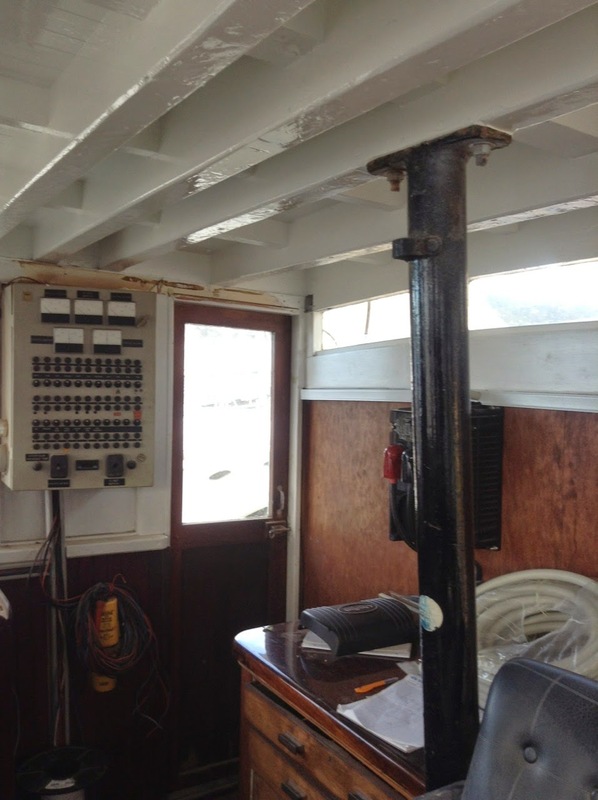 I took a quick look around the boat this afternoon and snapped some pictures for an update. We finally feel as if we are getting somewhere. and is now white again. Crisp, shiny, bright white. I worried that stark white would be too cold, but I love it. 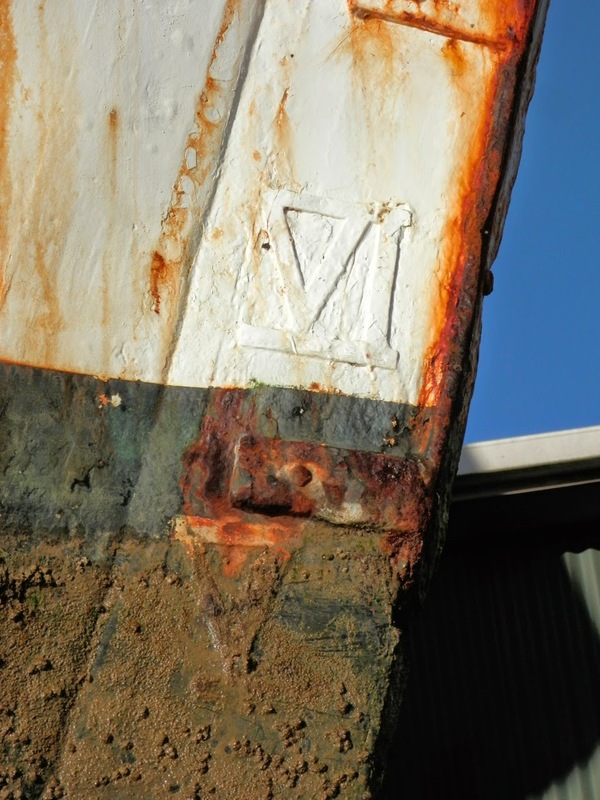 It enlarges the space so much, brings in heaps of light and it just says 'boat'. 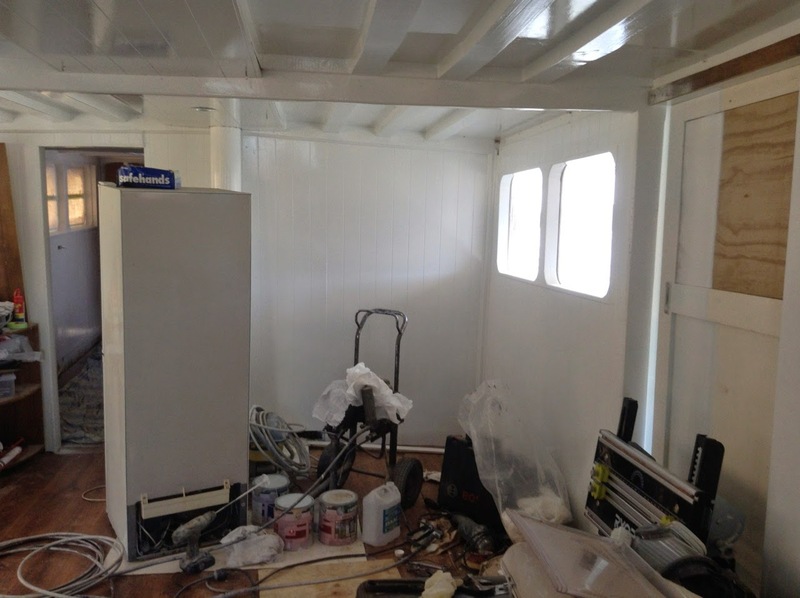 The galley is painted too, white again. There will be wood trim around the edges of the ceiling - helps hide the cracks and the power cords that will be run through soon. 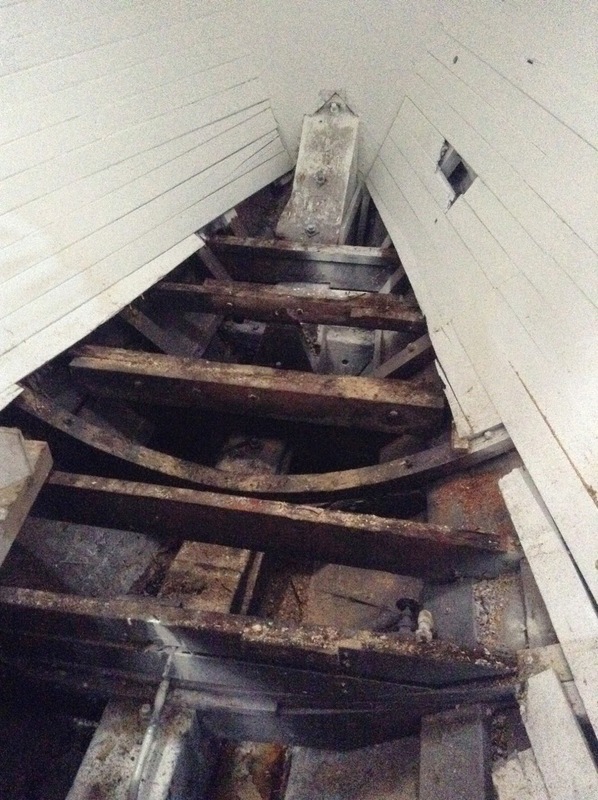 And we've painted the roof of the wheelhouse (you would not believe how stained and revolting it was - probably from years of nicotine as the captain smoked while steering the boat - lucky no smell remains). 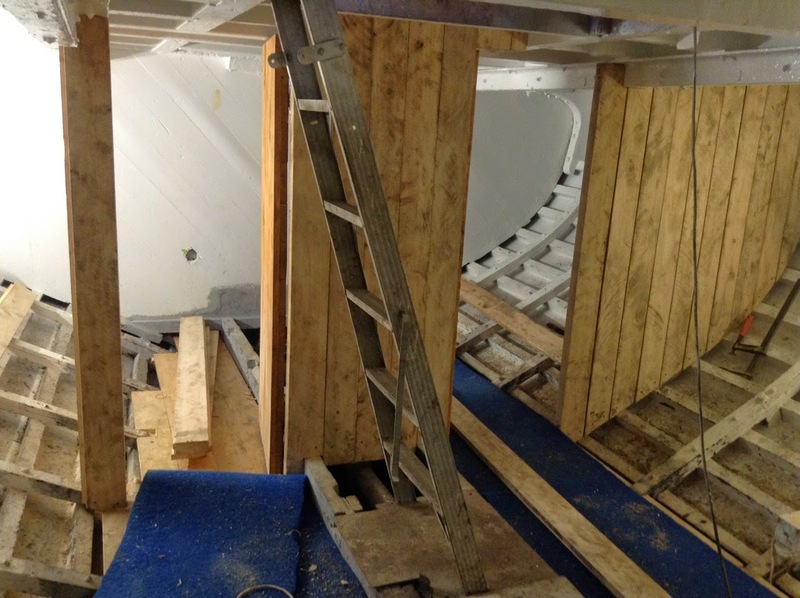 The old floor in our forward cabin has been ripped out ready for a new one. 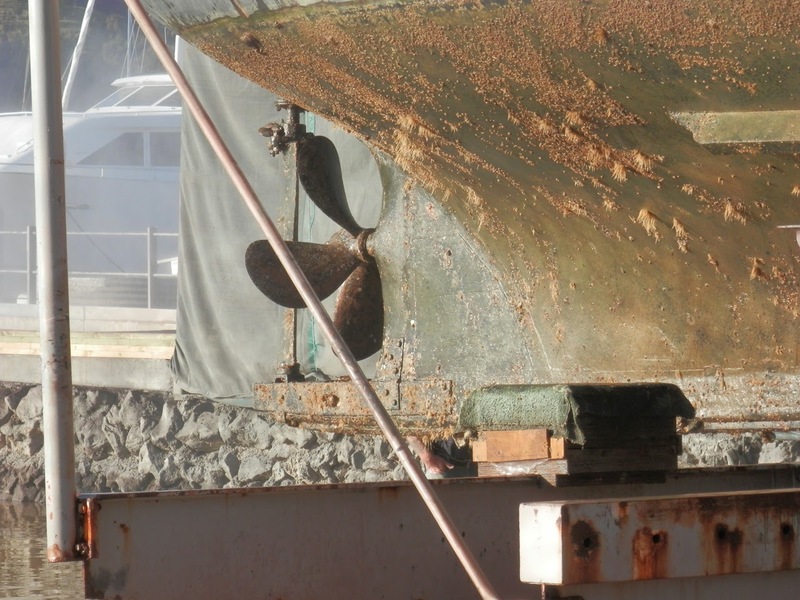 I love seeing the big heavy timbers of her keel. 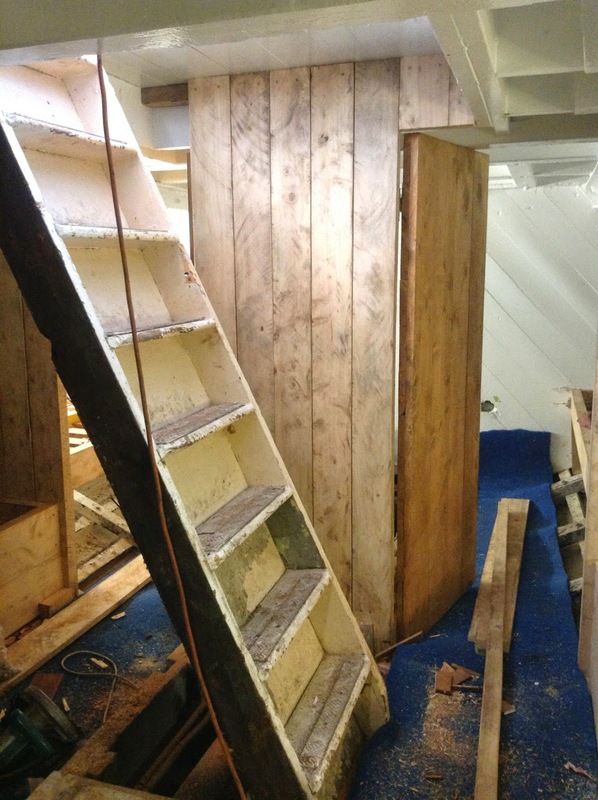 There is a staircase to get to the top deck now instead of a dodgy ladder. 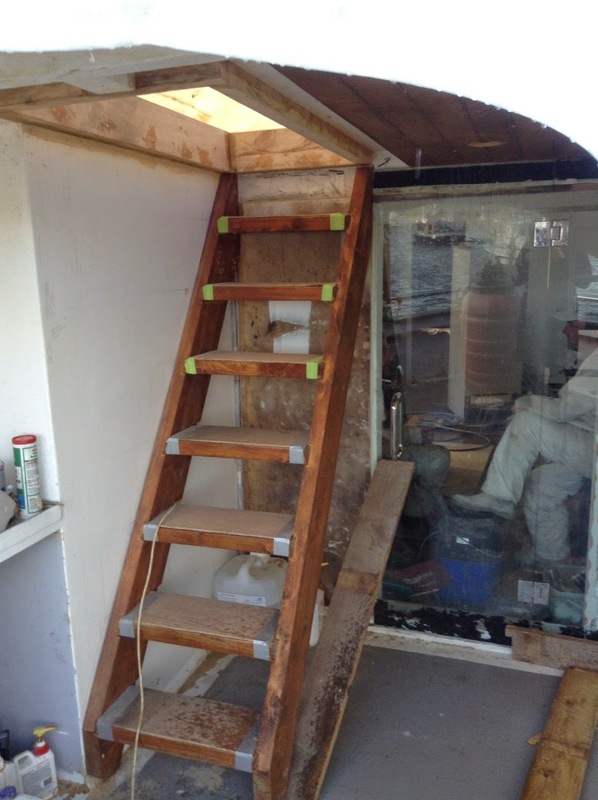 And the staircase has a new hatch through to the top deck. But the most substantial progress of all? 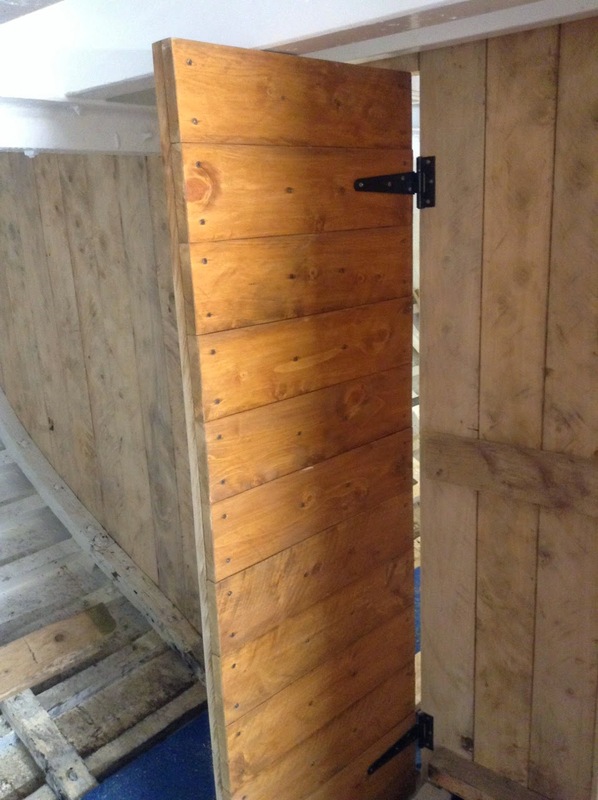 In the once-was-fishhold, we now have the beginnings of walls and doors and we have new floor to walk on. 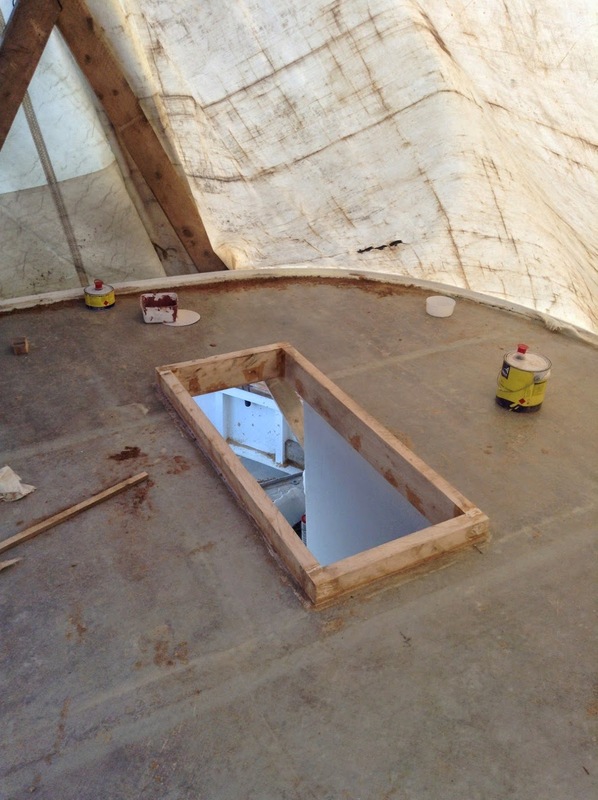 This will be the kid's cabins and playroom. After a long, tiring month, I'm now have two weeks of annual leave and the kids have two weeks of school holidays. So I'm not sure whether I'll get heaps done, or nothing at all. Stay tuned! 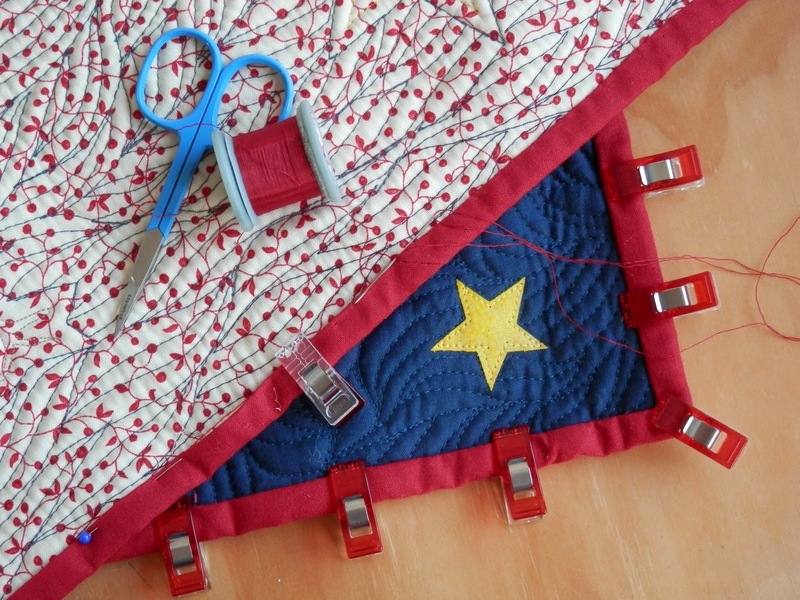 What's your favourite part of making a quilt? I know lots of people don't like hand stitching binding, but I do. There is something about each stitch taking you closer and closer to a finish. Bindings make a huge improvement in the look of the quilt too. Well, every step makes a huge improvement in the look of the quilt, but binding is just that final 'wow' step. And let's say it, there is something about hand work too - repetitive, soothing, relaxing. Another thing about hand stitching a binding is how rarely I need to unpick. Maybe that's a silly reason to like it so much, but it's true! I'm not a huge gizmo and gadget girl, but one thing that has made my binding process even more pleasant is using Clover wonder clips. I won a packet (see, I doubt I would have bought them myself) and I love them. I used to get pricked by pins if I pinned my binding down, or a sore hand from holding the binding if I didn't pin. Now I get neither. Note: I've no affiliation to Clover, nor Grandmother's Garden, which is the shop the link takes you too, it was just the first shop to come up when I googled Clover wonder clips New Zealand. Maybe the other reason I like binding so much is that it means I've made all the hard design decisions. It means that I'm either happy with how the quilt has turned out, or, if I wasn't happy, at least it will be finished and done with shortly. What's your favourite part of making a quilt? And then, probably more telling, what's your LEAST favourite part?! Now, just for kicks and giggles, I was alerted by a friend that my mug shot was in the NZ Quilter magazine this month! NZ Quilter is our first and foremost quilting magazine in New Zealand, so I was pretty stoked to see I had a little write up.